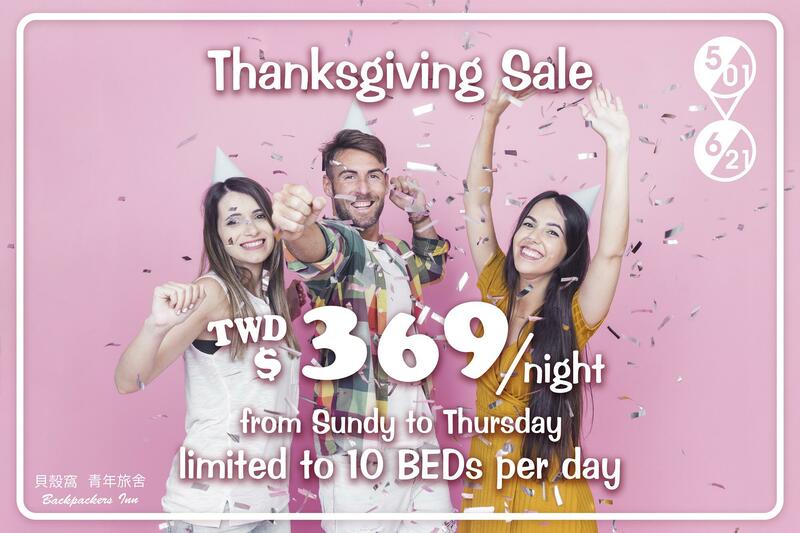 Special Offer: TWD$ 369 /night. Room type: Single bed in MIXED dorm & FEMALE dorm. This promotion is only available on 05/01-06/21 from Sundy to Thursday !! This promotion is limited to 10 BEDs per day !! 1. This project is not re-used with the other offers. 2.. Room type: MIXED/ FEMALE dorm with a single bed. 3. This project will be booked from the phone call reservation, Facebook message, email and the latest booking system. 5. This project is only available from Sunday to Thursday. 6. In case the weather of typhoon, earthquakes, or other natural disasters, the deposit will be reserved for 1 month or it can be refundable (NOT included the service fee). 7. Backpackers Inn, Taipei reserves the right to modify or discontinue this offer without notice. 8. If you have any question, please make a phone call to 02-23882833.